In The Whole Truth, Mike Lassiter (Gabriel Basso) is charged with murdering the wealthy Boone Lassiter (Jim Belushi), his father. Family friend and defense attorney Richard Ramsay (Keanu Reeves) takes on this personal case when he swears to his widowed friend, Loretta Lassiter (Renée Zellweger), that he will keep her son Mike out of prison. Together with new colleague Janelle (Gugu Mbatha-Raw), Ramsey reveals the dark side of Boone to the court and they fight to reveal the whole truth about Mike’s innocence. Of course, uncovering the truth is not as easy as it seems. Directed by Oscar nominated director Courtney Hunt and written by Rafael Jackson, we realize that uncovering the truth is not as easy as it seems. Check out incredible interview with director Courtney Hunt as she chats about compelling film The Whole Truth that opened in theaters today and available On Demand now. Keanu Reeves For The Defense Trailer: The Whole Truth! Keanu Reeves stars as defense attorney Richard Ramsay, who has promised his widowed friend, Loretta Lassiter, that he will keep her son, Mike, out prison. Thing is, Mike is on trila for killing his father – her husband – and things may not be as they seem. The Whole Truth also stars Renée Zellweger and will be in theaters and on VOD on October 21st. The trailer follows the break. We Have a Winner! Errr… Make That a Loser!! For those of you who are into pools and keeping score, the 2010 Fall TV Season has its first casualty. Fox has cancelled its critically acclaimed ratings bomb, Lone Star. Other early contenders for the #2 spot include ABC’s The Whole Truth and My Generation, and NBC’s Outlaw and The Apprentice. One Side of The Whole Truth is Not Like the Other! 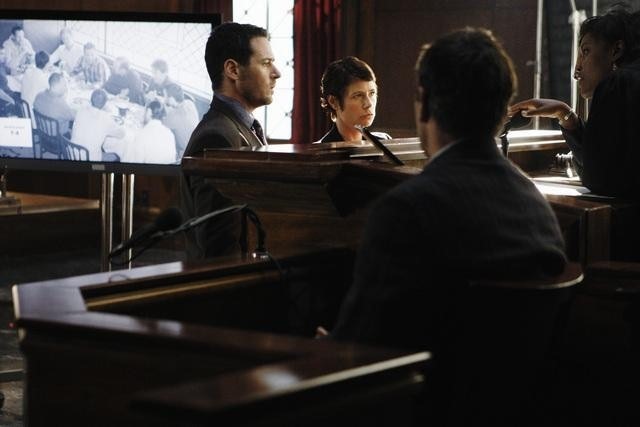 The Whole Truth [ABC, Wednesdays, 10/9C] is the series that gives us both sides of a criminal investigation. We see the arrest and then each ep bounces back and forth between the points of view of the prosecutor, Kathryn Peale [Maura Tierney] and defence attorney Jimmy Brogan [Rob Morrow], and their respective teams. It’s a great concept, but unfortunately, only one side really stands out. TELEVISION: ABC Unveils Ten New Series as it Presents Its 2010-11 Schedule! ABC has suffered some ratings losses as its once hot, innovative programming has lost some of its lustre. In an attempt to recapture some of that cool, buzzworthy cache, the network has added ten new series – six dramas, three comedies and an alternative [unscripted] series to its schedule. The new drama series: Body of Proof, a police procedural centered around a former neurosurgeon-turned-medical examiner; Detroit 1-8-7 – a documentary crew follows members of a certain Homicide Unit; My Generation – yen years after documenting a graduation high school class, a documentary crew revisits the graduates; No Ordinary Family [pictured] – a family on a vacation trip to the Amazon River changes an average American family in unexpected ways; Off the Map – five doctors who are without direction travel to rediscover why they wanted to become doctors; The Whole Truth – a unique legal series in that it gives us both sides of each case form each side’s point of view. The new comedy series: Better Together – three couples who’ve been together for varying degrees of time deal with each other; Happy Endings – who gets to keep the friends when a couple breaks up? ; Mr. Sunshine – the manager of a second-rate sports arena reaches a mid-level crisis when he turns forty. Alternative series, Secret Millionaire follows wealthy people who leave their posh surrounds to live and volunteer in some of the most impoverished and dangerous communities in America. Full show descriptions, cast lists and ABC’s full 2020-11 schedule follow the bump.